The Nu-Derm Fx Normal to Oily System is a complete skin care system specifically formulated for normal to oily skin and includes non-prescription products containing arbutin-based skin brighteners. Leaves all skin types clean and extremely soft to the touch. A refreshing blend of natural ingredients. 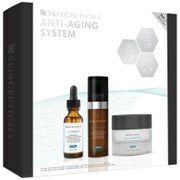 A topical non-prescription formula with a non-hydroquinone skin brightener. Smooth and tone rough or damaged skin. Formulated to provide long-lasting hydration for all-day moisture protection. A sheer UVA/UVB sunscreen that provides an elegant, matte finish. Obagi Nu-Derm Fx is a non-Rx version of the prescription strength 4% Hydroquinone products and systems and is Hydroquinone-free. I love this product, I immediately saw a difference on my skin, at first I had a little bit of peeling but just a few days after I had brighter skin, I also like the protection I get from the Sunscreen is very wearable not greasy at all. I'm very satisfied with this product.